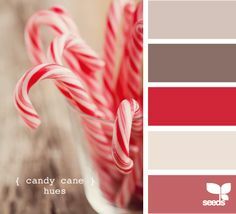 The Bugaboo Day 3 challenge for Christmas Chaos is a color challenge. I love these colors! I got to card making and made up three cards. 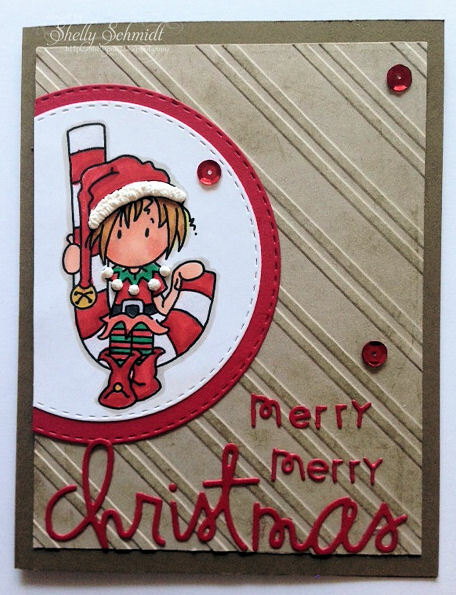 I colored all of the images the same- using Copics, Wink of Stella and Liquid Applique. The sentiment is SU, the punch is SU. These two really are the same, except I added less color on the raised part of the embossing folder (SU) and used different words (same die set) from Paper Smooches. Clear It Out-Stash- AG; stash- ribbon- years old, first time using diagonal SU embossing folder.... and that SU stamp set. Gorgeous cards Shelly - love the first one in particular. These are awesome Shelly. Love the embossing folders and you did a wonderful job coloring. I love that image. Wow I love them all, great backgrounds and colouring! Thanks for joining us for Bugaboo's Christmas Chaos good luck! Dawn Bugaboo DT. THese are perfect, Shelly! I loved my time on the DT with Bugaboo, there is something so whimsical and cute about their images and you have made these soar! 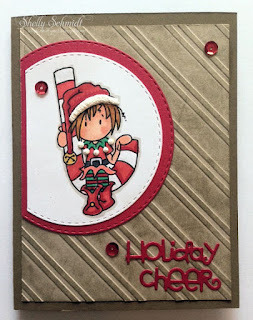 Adorable color challenge and card designs - fabulous work! Hugs! Great designs on all three of these Shelly! So cute and fun. How fun, I love all three cards. I love this image and have used it many times. Thanks for joining use for our Christmas Chaos at Catch The Bug. Beautiful card!!!! Glad you decided to join the challenge with us at Get Creative Challenges. Good luck, and hope you will join more challenges with us again. Another Bugaboo image I need to add to my collection! 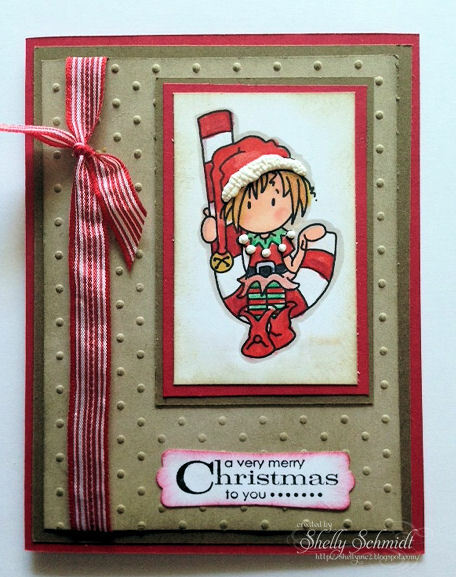 What delightful holiday designs you have created with this sweet, sweet image, Shelly! Awww. that's a nice design. Love the sentiment too. I love these cards! Bye, Bye Christmas, what a very cute image! Super cute card. Thanks for joining in on our Challenge in December. Good luck.